The 2017 USMS Club of the Year!!! An Adult Swimming Program for Fitness Swimmers, Triathletes, Competitive Masters Swimmers & You! WE ARE THE TEAM FOR EVERYONE ! 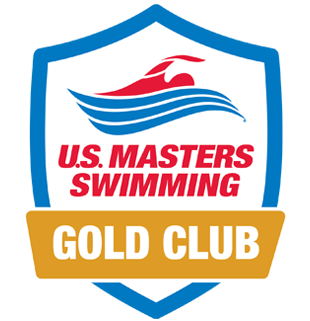 Palm Beach Masters Swimming is a U.S. Masters Swimming program located at 3 beautiful outdoor pools in Jupiter, West Palm Beach and Delray Beach, FL. We welcome adult swimmers of all abilities who want to improve their fitness, develop better technique, or train for any swimming competition. Whether you are a novice, triathlete, fitness or an elite swimmer, Palm Beach Masters offers an inspiring team atmosphere with organized workouts, competitions, clinics and social functions. Highly qualified coaches on deck provide one on one instruction to help swimmers of all skill levels and ages improve their technique and train for personal goals. Our coached sessions are designed to improve your swimming skills, make you more efficient in the water and increase your overall fitness level. Get fit, become a better swimmer, stay motivated, and meet new friends! Swim free for a week! See how much fun you will have group training, and discover how quickly you will improve with professional coaching! We are the team for everyone — from beginners seeking to increase fitness, to racers intent on setting a world age group record. Meet us at the pool and join the fun! The Wahoo Life! 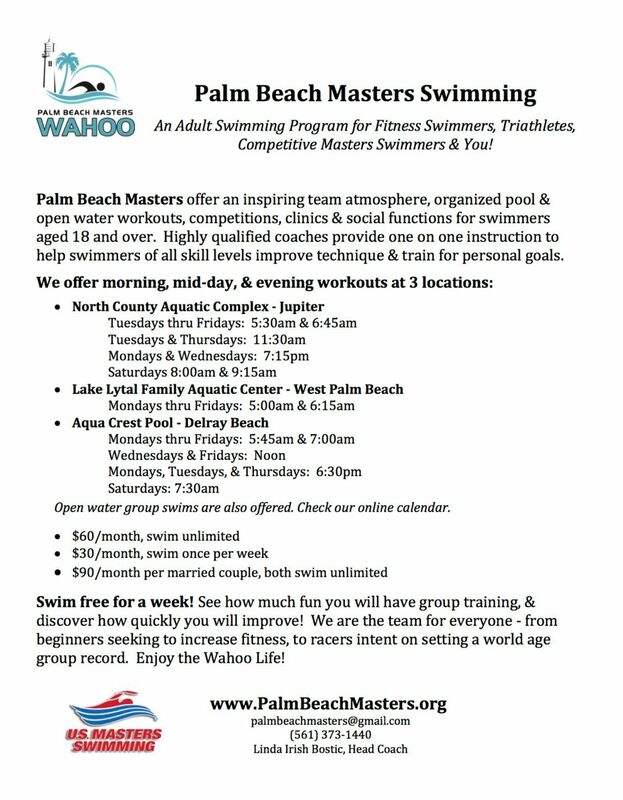 Palm Beach Masters informational flyer. Masters Swimming is all about. APR 20th workout RESCHEDULED to 6:15am in DELRAY. SATURDAY, APR 27th workouts CANCELLED at JUPITER. Pool closed for swim meet. Monday Mornings Sunrise Swim in Intracoastal off Jupiter Island at 7am in April. Note: Dues are $60/month to BOCC. Click here to Join USMS or Renew your annual Membership now! 100 x 100's !!! 2019 New Year's Challenge! SWIM 20K, 35K, or 50K in DECEMBER !!! PBM places 2nd at 2018 Spring Nationals in Indianapolis!